MilkPrice: What Makes Cheese Prices so Volatile? What Makes Cheese Prices so Volatile? Class III milk prices are very dependent (almost totally) on cheese prices (April 7 blog). 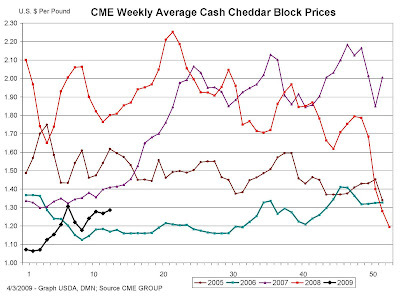 Unfortunately, cheese prices are very volatile - as shown in the chart below. This volatility in cheese prices is what causes the huge swings in Class III milk prices. Cheese pricing is determined primarily by supply and demand. What supply and demand factors make cheese prices so volatile? Let's first examine the biggest factor on the demand side. Most of the cheese produced in the U.S. is consumed in the U.S. So the first thing item to explore is U.S. consumer demand for cheese? Below is the last 38 years of consumption data. As can be seen from the graph, cheese consumption is not volatile and is in fact stable, growing nicely, and apparently very predictable. Could U.S. consumer demand for cheese be "topping out"? Will future grow in cheese be slower than historical growth? It would appear that the steady growth in consumer demand that has taken place over the last 38 years can be expected to continue. Now that one very large and obvious item has been identified as not contributing to volatility, we'll look at some other factors in an upcoming blog. Where are Class III prices going? Is Milk Pricing Really Tied to Cheese Prices?